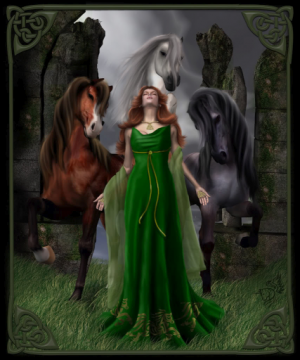 In Rhiannon’s story so far we traced the tale of how Rhiannon arrived in Dyfed riding a great white horse, arrayed in gold, an enchanted and enchanting lady. With resourceful guile, using her small bag, she and her chosen consort Pwyll, trap Gwawl, and force him to free her from her betrothal to him. Gwawl also agrees her terms not to seek vengeance. Rhiannon and Pwyll depart for Dyfed and live happily there for several years. That is the First branch, episode 1. At first all is well but then in the third year the Dyfed nobles turn against Rhiannon because she has not produced an heir, a son. Pwyll pacifies them, asking them to wait out the year. Rhiannon then gives birth to a boy. But in the night the baby disappears. Rhiannon’s maids are terrified for their lives because they failed to guard her and fell asleep. One has a solution. She kills a newborn hound pup, and uses its blood to smear Rhiannon’s face and hands. The bones are laid beside the sleeping queen. When Rhiannon awakes the next day the maids insist she went mad in the night, became violent, and committed infanticide and cannibalism. Rhiannon cannot prevail against six united testimonies. Pwyll again stands by Rhiannon, refusing to set her aside. Rhiannon consults her advisers and agrees to do penance. For seven years she will sit at the castle gate at Arberth, by the mounting block. There she will tell her shameful tale to all comers who do not know it, and even carry them on her back into the hall. Far away in Gwent-Ys-Coed in the east, a foundling baby appears on the threshold of the court, close to a prize mare and her newborn foal. The child is rescued from its monstrous abductor, and adopted by Teyrnon the horselord and his wife, the Lady of Gwent. The boy grows at heroic speed, showing a strong affinity for horses. He is named Gwri Goldenhair: eventually his resemblance to Pwyll is unmistakable to Teyrnon who was once a retainer to Pwyll. He and his lady resolve to return the boy to Rhiannon and Pwyll. In Dyfed Rhiannon greets the party from her position at the Narberth mounting block. Following her penance she offers to carry them into the court, and explains this is due to her crime of killing her son. Neither teyrnon nor Pryderi will let her carry them, and all, including Rhiannon go into the hall to feast. After eating when it was time to converse, Teyrnon recounted the tale of who the boy was. He announces that the accusations against Rhiannon are false. Everyone agrees this is Pwyll’s son. Rhiannon exclaims that if this were true she would be delivered from her ‘escor’ care, anxiety. ‘oed escor uym pryder im pei gwir hynny’ ‘I would be delivered of my care if that were true’ According to tradition the first words a mother addresses directly to her child, are the appropriate source of the child’s name. cf. Lleu’s naming where his mother is tricked into speaking to him after refusing to have anything to do with him. An eminent noble, Pendaran, points out that Anxiety is a good name for the son of Wisdom, Pwyll’s name. He is proposing to formally confirm the child’s paternity, and also making a pun on Rhiannon’s tragedy, via ‘escor’ as the verb for birth labour. Rhiannon herself is concerned to know the childhood name of her son as it may suit him better. Pendaran disagrees, and so Pwyll mediates, deciding to adopt the name Pryderi by reference to the maternal naming tradition. Teyrnon refuses any reward, but is jointly installed with Pendaran as Pryderi’s foster parents. Rhiannon was then able to see her son become an adult, a handsome man admired by all for his prowess in sports and lordly virtues. In the fullness of time Rhiannon was widowed, and Pryderi ruled the seven cantrefs of Dyfed in prosperity and friendship with all. 2. ⇑ cf. Lleu’s naming where his mother is tricked into speaking to him after refusing to have anything to do with him.